Seven Chinese were arrested in Victoria Falls in possession of more than 20kg of rhino horn pieces valued about $1 million. Zeng Dengui (35), Peicon Jang (35), Liu Cheng (23), Yu Xian (25), Yong Zhu (25), Chen Zhiangfu (30) and Qui Jinchang (29) were arrested following a search at their rented house in Aerodrome suburb on Sunday morning. The rhino pieces were allegedly hidden in plastic bags and boxes. 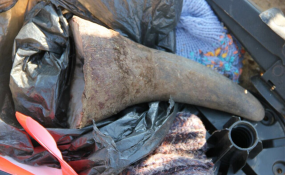 Police received a tip-off that the seven were in possession of rhino horns. The police applied for a search warrant before raiding the house on Sunday morning. The seven appeared before Victoria Falls magistrate Ms Rangarirai Gakanje yesterday. They were not formally charged for contravening Section 45(1) (b) of the Parks and Wildlife Act Chapter 20:14 as read with Section 128(b) of the same Act. The sections criminalise keeping, possessing, selling or disposing of any live specially protected animal, meat or trophy of any such animal. The magistrate remanded the accused in custody to Thursday next week. Prosecuting, Mr Bheki Tshabalala said the accused were found in possession of the rhino pieces at No. 858 Aerodrome on Sunday morning. "On 22 December information was received that there were some Chinese nationals at house number 858 Aerodrome, who were suspected to be keeping rhino horns. Police applied for a search warrant and proceeded to the house on Sunday morning whereupon searching they recovered a plastic bag containing several pieces of rhino horn in one of the bedrooms used by Liu," said Mr Tshabalala. He said several other pieces were found in a cardboard box and some stashed inside a mattress that had been cut for concealment. A digital scale was also recovered, the court heard. Mr Tshabalala said the pieces weighed 20,98kg and a veterinary surgeon confirmed that they were genuine rhino horns. The total value of the pieces is $938 700. Mr Givemore Mvhiringi of Mvhiringi and Associates is representing the accused.